Leader Andrea Horwath downplayed the error while the Liberals pounced. Ontario NDP Leader Andrea Horwath speaks at a campaign stop in Ottawa on May 20, 2018. PETERBOROUGH, Ont. — Ontario's New Democrats, often accused of fiscal incompetence, made a $1.4-billion annual costing mistake in their election platform, the party's leader was forced to admit on Sunday. The miscounting of a $700-million annual reserve fund as revenue rather than as an expense will affect deficit projections for several years, Leader Andrea Horwath conceded. 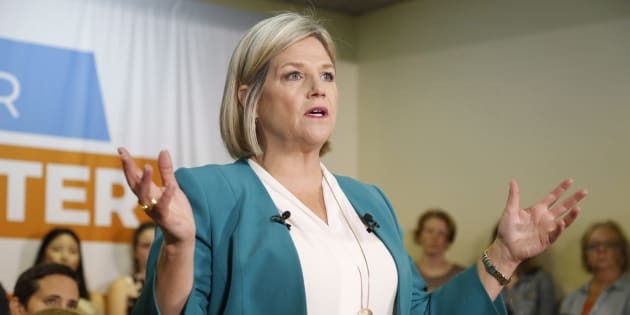 At the same time, Horwath downplayed the problem, saying it would have little affect on the party's campaign platform — or what could be achieved if the NDP were to form the government after the June 7 vote. "It doesn't prevent us from doing any of the things that we believe we can do to help get rid of hallway medicine for example, and fix seniors' care in our province," Horwath said on her campaign bus in eastern Ontario. "The deficit will be a little bigger than expected, but we still will be on the trajectory to balance." With two weeks to go before the provincial election, the gaffe became immediate fodder for the Liberals, who gleefully jumped on the error. "The NDP insist they're ready to form a government but for the last week they've had a tough time explaining how their plans will actually help people in Ontario," The Liberals said in a statement. "Now the NDP is admitting they've made a $7-billion dollar mistake in their platform — an error that will lead straight to higher taxes and lower job growth," the Liberals said. "It's clear the NDP are not ready to take on (Progressive Conservative Leader) Doug Ford, keep our economy strong and deliver for families." The NDP had been buoyed by recent polls showing the party has attracted the attention of voters as a potential alternative to the long-governing Liberals under Premier Kathleen Wynne. Just how much the impact of the mistake might have remained to be seen. Horwath, however, said people expected her to own up to it, and that was what she was doing. She insisted the error amounted to only a fraction of the province's overall budget. "People want to have the kind of leadership that isn't afraid to be honest about making a mistake like this," Horwath said. Not surprisingly, however, the Liberals saw it differently. Added up over the five years laid out in the NDP's budget calculations, it would make for a projected deficit $7 billion greater than initially calculated. Horwath said the deficit would be a "little bit bigger" than expected and balancing the budget would take longer. However, she said, the party's plans were "solid." The New Democrats had previously insisted the costing of their platform had been verified by former Parliamentary budget officer and economist Kevin Page. He confirmed the error on Saturday. "Looks like a spreadsheet type of error," Page told the Ottawa Citizen, which first reported on the mistake. Horwath said Page appeared to have initially missed the error, which is why she had at first dismissed questions about the problem. The Liberals said the amount involved was equal to the combined annual operating budgets of two of Toronto's main hospitals.